As well as regular dental check-ups, a good dental hygiene regime isessential to maintaining a healthy mouth. Good dental hygiene involves team work, combining regular visits to the Hygienist with a strong home care routine, including regular proper brushing and flossing. Hygienist appointments are important for patients of all ages. At your dental hygiene appointment, your Hygienist will thoroughly clean your teeth in a procedure known as a scale and polish. 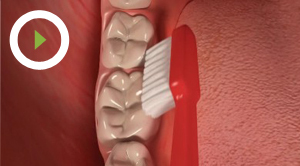 This involves using special equipment and pastes to remove all plaque and tartar from your teeth, particularly important in areas that are difficult to reach with brushing alone. Your Hygienist can also help to treat and prevent gum disease, which is one of the leading causes of tooth loss, and which can also lead to other unpleasant conditions such as bad breath. Early symptoms of gum disease include gums that bleed when you brush your teeth, swelling and discomfort in the gums. If you notice any of these symptoms you should book an appointment with a Hygienist straight away. Many people will experience mild gum disease at some point in their life and, as with all dental health conditions, the quicker it is spotted, the easier it is to manage and treat. As well as thoroughly cleaning your teeth at the practice, your Hygienist will also provide you with bespoke home care advice, including the best brushing techniques for patients of all ages, and the correct way to use products such as dental floss or interdental brushes to help keep your mouth happy and healthy. Our Hygienist also offers private tooth whitening sessions, using the popular Zoom tooth whitening system to give your smile an extra brightness boost. If you are interested in tooth whitening, please contact our reception team to find out more information and to book an appointment.